I sat uncomfortably on the southern beach of The Neck on Saunders Island. Although the sun was shining, it was chilly and I was acutely aware of being alone. 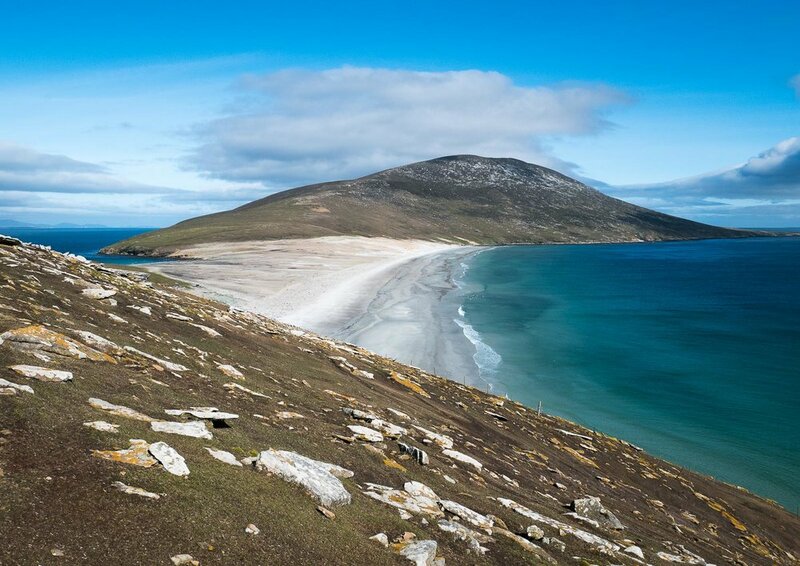 The Saunders Island settlement, a remote location in the northwest of the Falkland Islands archipelago was only about six miles distant as the crow flies, but the off-road journey had taken nearly two hours. There was no Internet access, no cellphone signal and no landline in the old military portacabin that was to be my home for the next few days. There was a two-way radio but I had been advised that it would only be monitored in the evening. The Neck seen from Mount Richards. This, for a short period , was my idea of heaven! And of course I was not actually alone. At this time of year, the expansive sand dune is home to thousands of gentoo penguins nesting in small rookeries. The Neck, a narrow saddle of land, sits prominently between two large hills, Mount Richards to the east and Mount Harston to the west. It has a beach frontage on both the northern and southern aspects separated by a gentle bank that rises to about two hundred feet above sea level at its highest point. The penguins nest on the higher ground. Gentoo penguins pausing, mid-ocean to check their surroundings before proceeding further. Looking out to sea from the southern beach on The Neck. A few gentoos in the foreground can be seen preening themselves before returning to their rookery. Understanding the behaviour of one’s subject is always a positive starting point for any successful wildlife photography venture. Whilst one can prepare by reading and watching videos of the species, however, there is no substitute for just spending time observing their activity in the flesh. So, sitting on that southern beach, observe I did. It was late afternoon and many of the gentoos were far out at sea, returning from their fishing ground. They were mustered and moving together in small groups and, aided by binoculars I could see them porpoising towards me. Every thirty seconds or so they would stop, rest on the water and check their surroundings. They would then dive, disappearing under water and appearing a few seconds later, porpoising again and repeating the exercise until they reached the shoreline. Their movement strategy looked like great fun but clearly had a more serious purpose, that of identifying and avoiding predators, both at sea and on the shoreline. Predicting where they might appear following each dive was almost impossible. Sometimes the group would split and move in opposite directions. Occasionally they would move parallel to the shoreline and appear to my left or right several hundred metres from where they had disappeared. Over time, I became convinced that they had spotted me on the beach and were avoiding landing near my position. Like any wildlife photographer, I am always interested in capturing the unusual in creatures so it became something of an obsession for me to capture the perfect photograph of a porpoising, flightless, penguin-in-flight! I camouflaged myself and lay lower to the beach to avoid detection. On this first afternoon I was equipped with a Nikon D810 with Nikkor 500mm f4; a 300mm f4 and 14-24mm f2.8. If I had been able to accurately predict where the penguins would appear, the 500mm would have been the perfect choice. As it was, the lens which is both heavy and unwieldy, had too narrow an angle of view, so that by the time I had located the porpoising penguin in the viewfinder, it had long gone. A gentoo rookery on The Neck at twighlight. A large group of gentoos returning to their rookery. I resolved to fit the 300mm f4, a much smaller and lighter lens that can be readily hand-held, with a wider angle of view. By keeping my right eye to the viewfinder and left eye open to scan the sea, my chances of locating the penguins within the viewfinder and acquiring focus-lock was much improved. I was using the camera in continuous high (burst) mode (5 frames per second (fps)) and exposing using aperture-priority auto. I normally shoot in manual mode and utilise auto-ISO. Unfortunately using auto-ISO reduces the shot buffer in the D810 to about 15 frames before the camera stops firing in order to write the images to the memory card. In the circumstances therefore, using aperture-priority auto became an acceptable compromise. I persevered with this combination for about 45 minutes and failed to achieve anything satisfactory. Although it provided a wider angle of view with which to locate the penguins in the viewfinder, at the range I was shooting, the 300mm had insufficient reach to get the detail I was seeking. Further, even though I now had a larger shot buffer, the continuous high rate of the D810 was too slow and the buffer still too small to enable me to capture the image I wanted. I returned to the portacabin to retrieve my Nikon D500. The D500 has a continuous high rate of 10fps and an enormous buffer of 200 exposures. Further, as a 1.5x crop-frame camera, it gave me the extra reach that I was looking for, given the 300mm lens an angle of view of a 450mm equivalent. At the same time, I abandoned my 500mm f4 lens at the portacabin, choosing to go light. It was 7.20pm by the time I returned to the shoreline. The light was beginning to fade and the numbers of gentoos returning from the sea had subsided to a trickle. What’s more the sun had long since disappeared behind heavy cloud and the wind was picking up speed. I resolved to look for flying penguins tomorrow. I climbed towards the high point on The Neck and watched as a cruise ship crossed the distant horizon being buffeted by the wind, which in turn was whipping the dune into a full-on sandstorm. ‘Whipping’ was an accurate description as small stones and grit flew across The Neck at 50mph. I passed the carcass of a Gentoo on the sand and in a moment of melodrama (according to my wife I am prone to melodrama) considered my own fate if I remained. “Get a grip,” I told myself. This is the Falkland Islands and 50mph winds are routine. There is a reason why virtually no trees grow here! What is more, the stoic little creatures that had been the focus of my attention for the last few hours were continuing to go about their business without a second thought. I resisted the natural urge to seek shelter and instead summoned the motivation take some pictures. A vulture-pecked, decaying penguin carcass lies on the sand dunes of The Neck. Gentoo rookeries can be seen in the background. Gentoos appear unmoved by the battering sandstorm. Using the D500 with 300mm f4, I braved the weather and bagged some of the best images of my entire trip. I continued to shoot in aperture priority mode and set the ISO to 1000. I was shooting penguins against a bright sky and sand dune, so set the exposure compensation at +1EV to avoid losing too much shadow detail in their dark feathers. I lay flat to the ground to get below the penguins eye-line and captured numerous photographs of the penguins moving in the sandstorm. Some their struggle with the elements, others gave the impression of serenely floating or gracefully skating on ice. 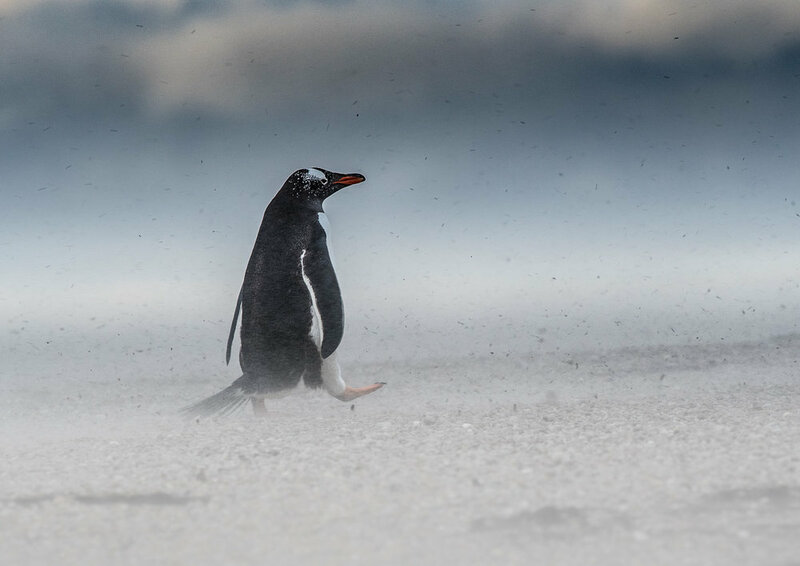 A gentoo penguin walking into the teeth of the wind, laced with fine particles of sand and grit. COMING HOME: A group of gentoos walk into the prevailing wind on the north beach of The Neck. 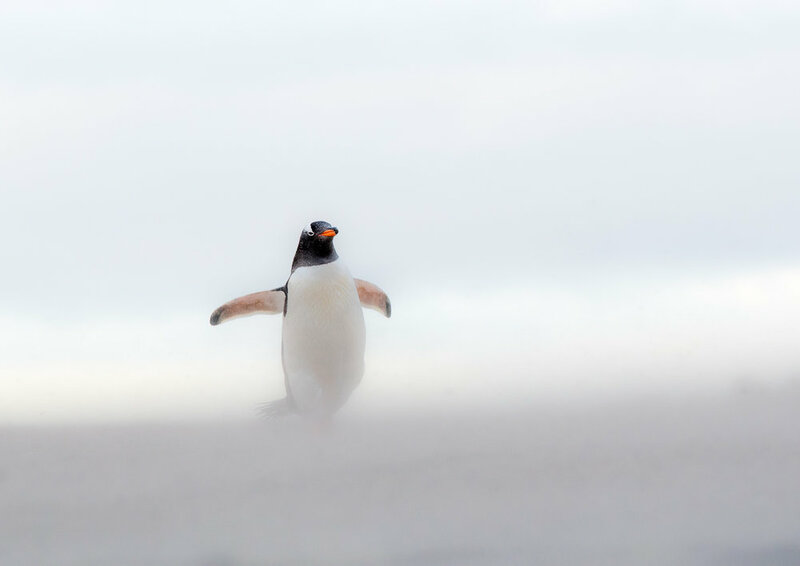 FLOATING ON SAND: a gentoo penguin appearing to gracefully float above the sand. In the midst of this unusual scene, I encountered a fierce fight between two gentoos. I have no idea what triggered it, but this had clearly escalated beyond a commonplace squabble between seabirds. The one pursued the other with vicious intent. There was pecking; biting; kicking; slapping and body-slamming - quite bizarre! I set the D500 to continuous high (10fps) and followed the action with periodic bursts, panning with the action. Many of the shots were ineffective as other penguins in the colony obscured the action and of the remainder, few are good enough to stand alone but, together with others in the sequence I still managed to get some usable images. I took 108 shots over a period of two minutes. The fight moves through the rookery as others watch impassively if at all. Rolling around in the sand. Not working as a standalone picture, it goes well with the other images to tell the story. The one has the head of the other held in his beak. Even the usually bold and intimidating Falklands great skua skips out of the way of the of these determined combatants. Now he has him in a pinch hold! DUELLING PENGUINS: This was probably the most effective shot of the sequence, dramatic, free from distractions and sufficiently sharp to stand alone. 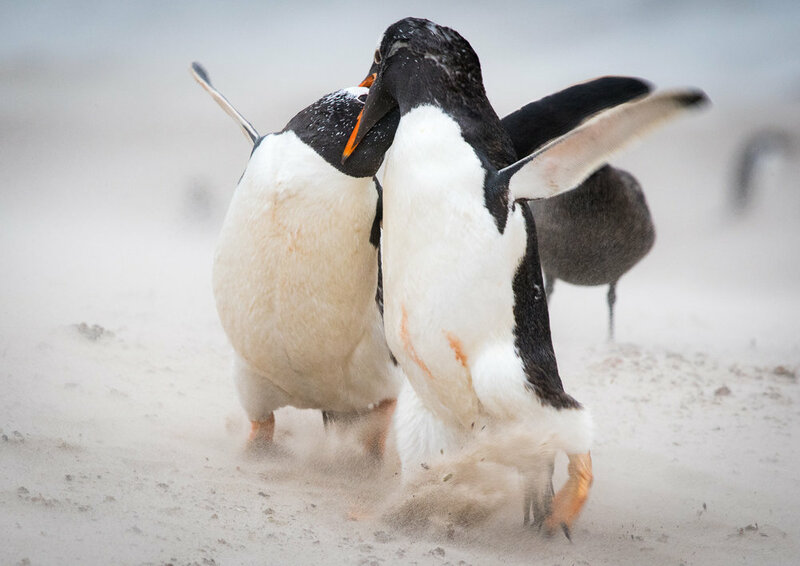 Duelling Penguins was shortlisted for NHM Wildlife Photographer of the Year 2017 award. As often happens in unexpected moments of furious activity, I became so focused on the effort to keep up with the action that I gave no thought to adjusting my camera settings. Had I had time to think and prepare, I would probably have set a faster shutter speed. Given the final results, however, this may have proved a mistake. The evidence of movement adds to the sense of dramatic action and a faster shutter speed would probably have reduced the impact. In any event, perhaps more by luck than judgement, I got some pleasing shots. Of all the shots I captured that evening, one won Guardian Photograph of the Month in January 2017; two were shortlisted for Wildlife Photographer of the Year 2017 and one of these recently featured on the front cover of Wildlife Photographic Magazine (September/ October 2017). The following afternoon, I returned to the south beach of The Neck with my Nikon D500 and Nikkor 300mm f4 in a revised effort to capture a flying penguin. I got some much better shots although proprotionately, my keeper rate was pretty low given my use of burst mode and testing the buffer of the D500 to its limits. This time I was back in my more comfortable manual exposure mode with auto-ISO. As always, I was using continuous auto-focus, exclusively controlled by the back button AF-On and with only a single focus point being used. I reverted to the ‘one-eye-open’ technique that gave me the best opportunity of spotting the birds whilst nailing the shot. The sunlight was good but when the birds were landing to my right, the low, late afternoon sun glared off the water. When the penguins were coming straight at me the lighting situation was easier. The shutter speed was set high to freeze motion and aperture to provide at least some depth of field increasing the chance of achieving focus across the whole bird. I took several bursts and chimped (checked) the results on the small LCD screen on the back of the camera. The shutter speed was still not fast enough and an examination of the camera’s rear screen revealed ‘blinkies’ on the penguins’ breast feathers indicating blown (overexposed) highlights. I doubled the shutter speed to increased the aperture and set exposure compensation to -1EV. ISO set itself to 800. The higher ISO meant a compromise in image quality but in the circumstances it was just about acceptable. More of a jumping rather than flying penguin, taken against the sparkling highlights of the crashing waves. This gentoo arrives on the beach by crashing though the surf. They go left, then they go right.. sometimes together, sometimes alone. Frustrating. The closest I got to a flying penguin. I got some reasonable shots but with hindsight I would not have increased the shutter speed or aperture and left the ISO lower. On a positive note, my fieldcraft was obviously an improvement on the previous day and the penguins were not discouraged from exiting the water opposite my position. 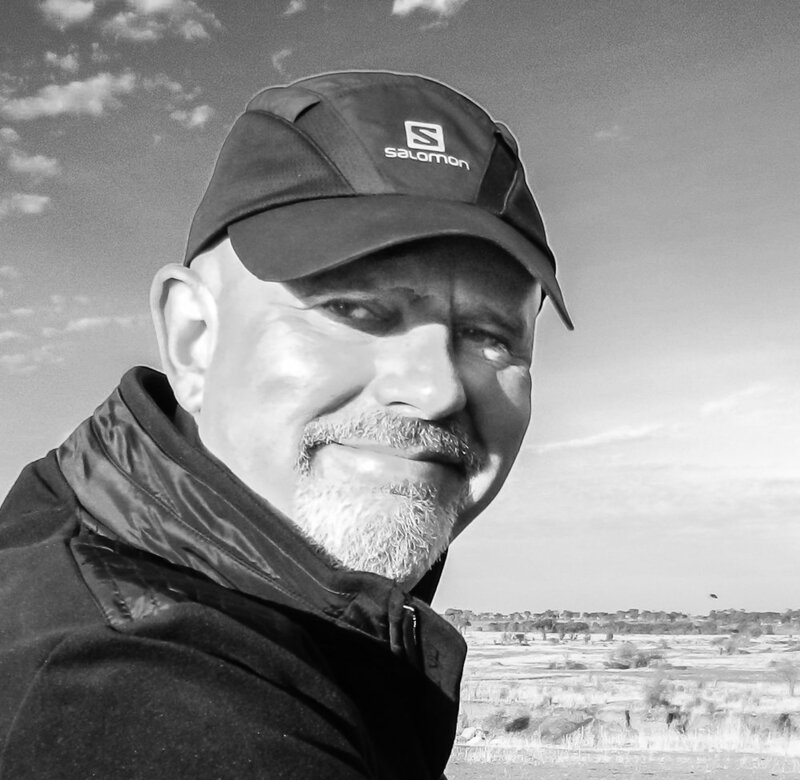 I spent four days on Saunders Island in November 2016 and will be returning with clients in early 2019 when, if the opportunity allows, I will revisit my attempts to capture images of flying penguins. 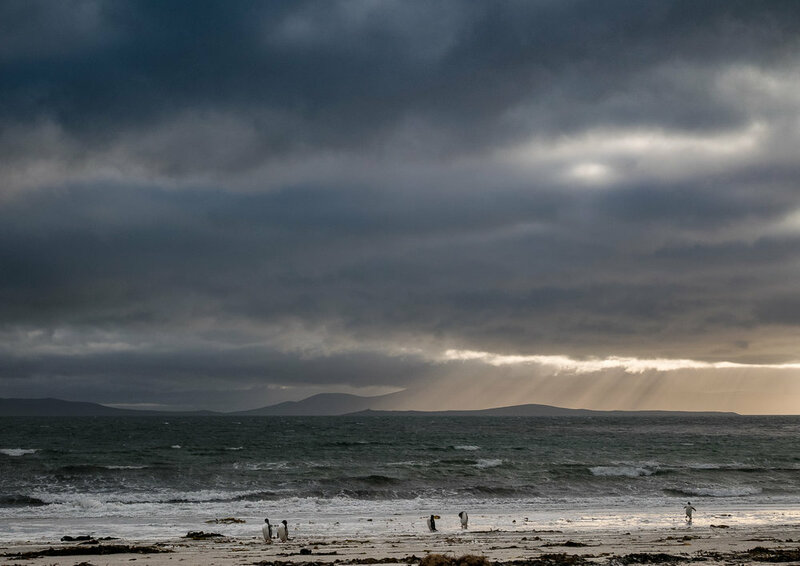 Saunders Island also offers amazing opportunities to get up close to magellanic; king and rockhopper penguins; black-browed albatross and imperial cormorants. It truly is a stunning location for wildlife photography. If you liked this article, please like it below and feel free to ask questions or post a comment. If you want to follow this series, subscribe to my newsletter at the bottom of the page. Alternatively, follow me on Facebook, Twitter or Instagram.